In this piece I have outlined an approach to coaching football, that will hopefully encourage thought and debate around how and why we coach. I want to make it clear that this is not a definitive approach on how to coach football, more a work in progress through things I have read and experiences I have had. I feel that as coaches we are often taught “how to coach” through national governing body coaching courses as if we are preparing for history tests, we get taught all the dates (details) but not how to answer the questions (application of knowledge), hopefully this piece will provide a bridge between the two, provoke ideas and encourage better practice. It is important to remember that I do not believe I have all the answers, this is simply an outline of an approach to consider when coaching football, the ideas in this piece will be developed upon in part 2. This piece has been heavily influenced by the WFA and their coaching methods which I cannot praise enough. Some suggested reading and listening on Raymond Verheijen’s and the WFA methods can be found below. These methods have been spoken about many times before online. I do not feel the need to completely explain the hierarchical structure of Communication (Non-Verbal) > Game Insight > Technique > Football Fitness because I will just be re-packaging the knowledge through another medium. Is the game of football still being played? Is the game of football still being learned? Are the players enjoying the game? By considering these three things when designing practices, you will ensure your players are practicing relevant to the game of football, learning/developing and having fun, the three pillars of youth football. Football tends to sit in its own lexical circle of language, language is not clearly defined within football. Take a minute to assess the following quote and what it means to you, “Mental toughness is needed in youth players”, what does this actually mean? What can a player do with that information? Having a clear and defined language inside a football club leads to better communication and understanding, thus making everything simpler. Coaching is about the transfer of knowledge, with clarity in terms of understanding the coach should be able to transfer knowledge easier to his players. SV author Rene Maric spoke about this in his piece for the KF Advent Calendar with his work at Red Bull Salzburg (http://konzeptfussballberlin.de/rm-special/). With clear language and structure, we can often go further in depth because we are avoiding misinforming and solidifying understanding. Football is not the same as gymnastics where you are marked on “how well” you execute a certain technique, i.e, a half volley into the top corner is worth two goals, opposed to a toe poke only being worth one. Much of the discourse in football coaching Is about creating “perfect” technique, obviously to be considered an elite player, you must have a solid technical base, but it is time we move away from using words like, “good, bad, excellent, awful” when describing technique and begin to use Football Action Language, to effectively describe what we as coaches see, for example, I would use the terms, functional technique v un-functional technique. It is better to teach players concepts and let them adapt them in situations as they see fit, this kind of autonomy creates better decision makers, rather than teach them a biomechanically one-size fits all “perfect technique”. Coaches should first and foremost understand the tactical and technical elements of football as well as having interpersonal knowledge (the understanding of oneself) and intrapersonal knowledge (the understanding of the ones they coach) added to this, they must COMPLETELY understand the context within which they are coaching. Other disciplines that aid coach development include, sport sciences, pedagogical techniques, psychological techniques, sociological contexts, physiology, neurology, the list goes on and on. Coaches should be life-long students of the game and are able to find new and innovative ways to improve and learn more about coaching and football. Knowledge can be found in all sorts of places, anyone that has read my pieces knows that Richard Feynman the physicist as had a profound impact on my coaching in regard to the way I and athletes learn. It is important that any knowledge gained can be related back to football or coaching as this is always the starting point. Football is team sport, I would go further than this and say that football is a team sport, played by individuals. It is vital to remember this when designing practice. It is important for the team to understand what they want to achieve and who must execute specific actions, at specific times within this context to achieve the teams designated goals. Often the term “team building” is misappropriated and used in a sense of a construction of a group “morale” or “atmosphere”. In terms of team building and a goal the team wants to achieve, this must be set by the coach. The team has to be in agreement over a certain amount of topics, How do we attack? What do we do after losing ball possession? What football actions must the left winger make when he comes inside? Once these agreements have been defined between the players and coach everybody has a much clearer understanding of what they should be doing in each context of the game, making it easier to assess football actions against a game model. Team tactical agreements in this sense evolve from simple to complex and from universal to specific. The ultimate goal for a coach is to develop the team whilst developing individuals, through this process the coach can develop the individual through specific instruction within the team context, hopefully developing both. Coaching should look like this, the coach defines and outlines rules and guidelines for the players within their game model, a detailed description of the tasks is then made, the coaching is then about improving the technical and tactical understanding of the players within these guidelines with the focus on being executing the defined football actions more often throughout the entire game. To summarize, action language is about saying what you see. To use an example, it is important to clearly define exactly what you are saying to each player. If you as the coach notices that your left-sided centre back is not stepping out to press the ball carrier quick enough, and stop the practice to tell him to be “more aggressive”, have you laid the structure for the player to understand what “aggressive” means in this context, the player may not understand that you are asking him to step out and win the ball higher, he may take this as aggressive in the challenge and may attempt a sliding challenge (thus leaving him on the floor and unable to complete further football actions). It is here that we have to be careful in our wording. Once we explain to the player what we want from them, it is fine to use terms such as “aggressive” because that term has been defined within this coaching context between the player and the coach, up until that point, “aggressive” is just a subjective term leaving much room from misinterpretation. What goes wrong in relation to the objective of football? Where on the field does this take place? Who played a role in it? Which specific elements are present that influence the players, the game or the circumstance? Using this matrix we are able to define the problem in action terminology and the players are able to understand the problem within their own context on the pitch, which leaves little room for misunderstanding. I think this tool is a fantastic reference point for thinking about problems in a football context. It is important that situations in the training session are football realistic because at the end of the day we are training football. This doesn’t mean we can’t train things outside of football, i.e handball, elements of differential training, in fact, I would advise coaches to definitely coach these things from time to time, but make sure they relate to the football context and the players understand how they relate, and what they can take from these exercises into a football context. Many repetitions of football actions are needed throughout the session, without wanting to wage too much into the blocked v random/Isolated v opposed training methodology argument, it is important that players can practice repetitively football actions whether or not you do this through game forms or isolated practice is up to the coach. 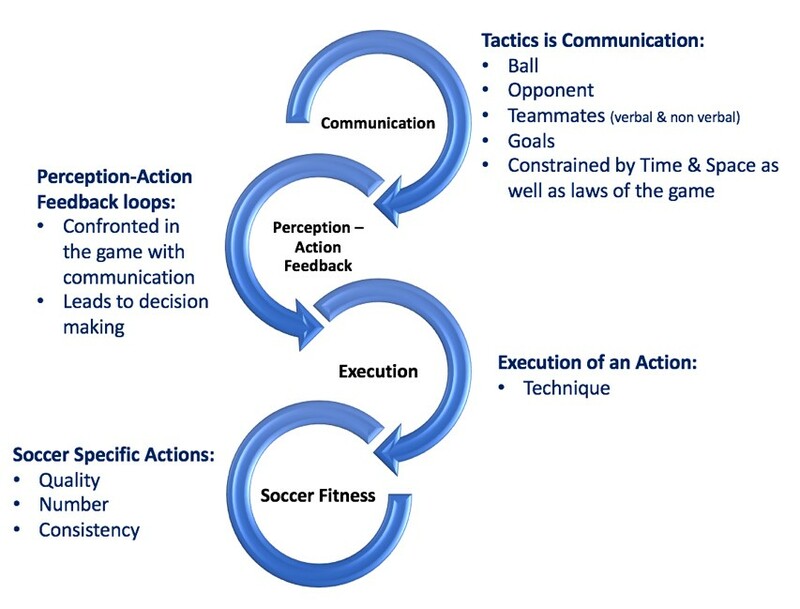 The only suggestion I would offer when designing these practices is to make sure that players have repetition without repetition, so that they are practicing football actions in different contexts and situations to help them understand the nature and context of football better, this is easier to get out of constrained game forms than isolated practices. I believe there is a space in a coaches training methodology for both unopposed and opposed/blocked and random practice, but they require good pedagogical knowledge to implement successfully. Training through game forms often allows better transfer of tactical understanding of the game, in comparison to the “closed drill” approach of learning skills in isolation, Environmental cues are essential for athletes to select and attended to, to adopt the correct skill execution in the tactical context of the game, and these environmental cues often do not appear in isolated training, and if they do, they are often unrealistic. I spoke about this topic in the final question of the last SV Mailbag piece, https://spielverlagerung.com/2018/10/08/sv-mailbag-coaching-and-training-october/, it is important to train full action of the football action, (pre, action, post) to develop footballers full understanding of the game and football contexts. I would suggest unopposed technique training as a supplement to training with a team, as additional work and not in place of team training, unless you are training a team who trains every day. I would also advocate unopposed practices for things like regeneration practice the day after a game. The final time I would train without an opponent is to create a tactical reference point for the players, this kind of training can still be made realistic if stimuli are provided such as, when to do things, how to do things, perception and orientation cues, but it is of the utmost importance that all these stimuli are game-realistic to provided building learning blocks, this kind of practice works very well hand in hand with video analysis. Age and talent appropriate coaching is vital to developing young athletes, pitch your sessions at their ability level. It’s also important to pay attention to the work-rest ratio if you are doing intense, high tempo practices make sure they have enough time between blocks of practice to recover otherwise the rate of successful execution of football actions will drop. Finally, proper coaching means that you are allowing the coach and the game to be the teacher. It is not one or the other as the debate rages on social media and in coaching circles right now, they are not separate entities. The coach needs to ensure they are designing session with implicit focuses these are then compounded by explicit coaching from the coach. I hope you have have enjoyed reading the first part in this series, hopefully you will go away with new ideas and considerations in regards to your coaching. 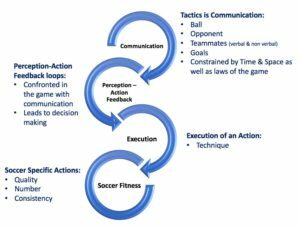 The second part will delve deeper into what is action language and how coaches can identify problems in their teams performances and correct these through coaching. I have a doubt about the psychological aspects of the game, not related to what has been said in the article. Its about composure on the ball. The only way I know how to teach not kicking it up field is improving the position of the players around the person,so that instead of hoofing the person can see the passing lanes. I understand that this has to be done in repetition, so, the ball player knows that there will be a person will be who he can pass to in case there is pressure. I have implemented this aspect with some friends of mine who are technically decent for the level we play at. So, this is from a tactical point of view, that is we increase their confidence by showing them that there are passing lanes in front of them and they need not panic. So, recently some new guys started playing with us, they are just out of high school but have good technical ability. The real problem is that they are not composed on the ball when someone is pressuring them, they panic and start hoofing. I have tried what I know but it has payed very little dividends. Do you have any suggestions to improve this mental aspect but not from a tactical point of view? Hi Manu, there are are couples of ways I think would be helpful. First, If this an issue of the players being anxious on the ball and scared of making a mistake on the ball, one thing a coach can do is develop an environment that permits mistakes in training and matches. It is important to focus on not only your reaction after a player’s mistake but also the teammates’ reaction. Remaining positive and constructive with the players at all times will be vital. I want to stress that this is not a quick fix. To change a certain aspect of a team culture will take time. I think explicitly mentioning the values of patience and courage in possession is primordial. A second strategy is to focus on where the players are putting their attention and at which moment. When under stress, the player’s focus will tend to narrow (I.e. tunnel vision) which will make him think that the only option is to hoof it up the pitch. Using key words such as “scan” to guide the player to look for options can help him in the early stages of learning to play under pressure. Key words are used with the aim of having the player internalize them so they become subconscious. Hope this helps! Sorry for the long response. I’ll try the first suggestion as what you mention(scared of making a mistake) is the reason for the hoofing although it will be difficult. Thanks a lot! Nice article. But it sounds so reductionist, especially how you have to be so detailed with the player. We already have this obsession with statistics. It’s like an American sport or something. My view is that the game is too fluid and the individual is relatively insignificant to lose the holistic view. And I think the interpersonal (coach and his staff + players) is far important for the game. Especially since players are Moody and need confidence and arm around the shoulder and advice, etc. This is where football philosophy comes from – the personality of the coach. The coach has to see the whole things and not be blinded or obsessed by specific aspects. When you say it is better to teach players concepts, could you elaborate or give a definition of what you mean by that just for clarity? Also, you say the ultimate goal of a coach is to develop the team WHILST developing the individual players, but wouldn’t it be better to develop the team BY developing individual players? Or are those 2 completely seperate coaching mentalities? I’d love to hear your thoughts on this, love this article and I’m excited to see what you write next.